The new report, published this week by the international chemistry journal Angewandte Chemie, focuses on a compound called TIC10. In the new study, the TSRI scientists show that TIC10's structure differs subtly from a version published by another group last year, and that the previous structure associated with TIC10 in fact describes a molecule that lacks TIC10's anticancer activity. "This new structure should generate much interest in the cancer research community," said Kim D. Janda, the Ely R. Callaway Jr. Professor of Chemistry and member of the Skaggs Institute for Chemical Biology at TSRI. Tumors can develop resistance to TRAIL, but Janda had been studying compounds that defeat this resistance. The news about TIC10 therefore got his attention. "I thought, 'They have this molecule for upregulating TRAIL, and we have these molecules that can overcome tumor cell TRAIL resistance—the combination could be important,'" he said. The original publication on TIC10 included a figure showing its predicted structure. "I saw the figure and asked one of my postdocs, Jonathan Lockner, to make some," Janda said. Although the other team had seemingly confirmed the predicted structure with a basic technique called mass spectrometry, no one had yet published a thorough characterization of the TIC10 molecule. "There were no nuclear magnetic resonance data or X-ray crystallography data, and there was definitely no procedure for the synthesis," Lockner said. "My background was chemistry, though, so I was able to find a way to synthesize it starting from simple compounds." There was just one problem with Lockner's newly synthesized "TIC10." When tested, it failed to induce TRAIL expression in cells, even at high doses. "Of course I was nervous," remembered Lockner. "As a chemist, you never want to make a mistake and give biologists the wrong material." To try to verify they had the right material, Janda's team obtained a sample of TIC10 directly from the NCI. "When we got that sample and tested it, we saw that it had the expected TRAIL-upregulating effect," said Nicholas Jacob, a graduate student in the Janda Laboratory who, with Lockner, was a co-lead author of the new paper. "That prompted us to look more closely at the structures of these two compounds." The two researchers spent months characterizing their own synthesized material and the NCI material, using an array of sophisticated structural analysis tools. With Assistant Professor Vladimir V. Kravchenko of the TSRI Department of Immunology and Microbial Science, Jacob also tested the two compounds' biological effects. The originally published structure has a core made of three carbon-nitrogen rings in a straight line and does not induce TRAIL activity. The correct, TRAIL-inducing structure differs subtly, with an end ring that sticks out at an angle. In chemists' parlance, the two compounds are constitutional isomers: a linear imidazolinopyrimidinone and an angular imidazolinopyrimidinone. The therapeutic implications of TIC10 may even go beyond cancer. 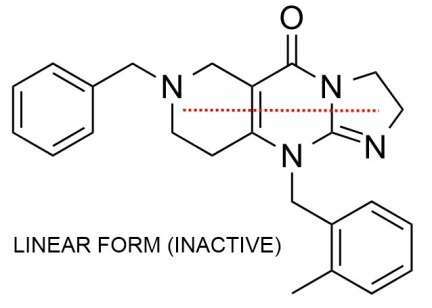 The angular core of the TRAIL-inducing molecule discovered by Janda's team turns out to be a novel type of a biologically active structure—or "pharmacophore"—from which chemists may now be able to build a new class of candidate drugs, possibly for a variety of ailments. "One lesson from this has got to be: don't leave your chemists behind," said Janda. More information: "Pharmacophore Reassignment for Induction of the Immunosurveillant TRAIL" DOI: 10.1002/anie.201 , http://onlinelibrary.wiley.com/doi/10.1002/ange.201402133/abstract. Brilliant work. These types of things need to be made more public. Kickstarter perhaps? Let's fund LIFE saving technology!! !